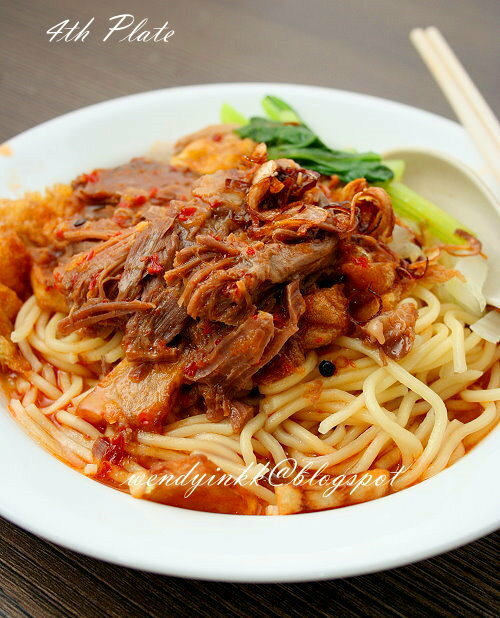 This noodle is a spin-off from the famous Muar Bandung Noodle, but it uses lamb shank instead of chicken and seafood. 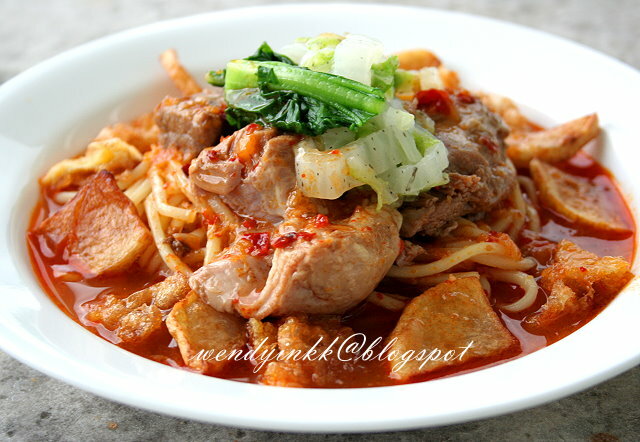 Annie of Annielicious Food asked me if this noodle is really that addictive? Hmmm.... My hubby asked me to make sell this noodle. Well, you see, he is a mutton/lamb nut. 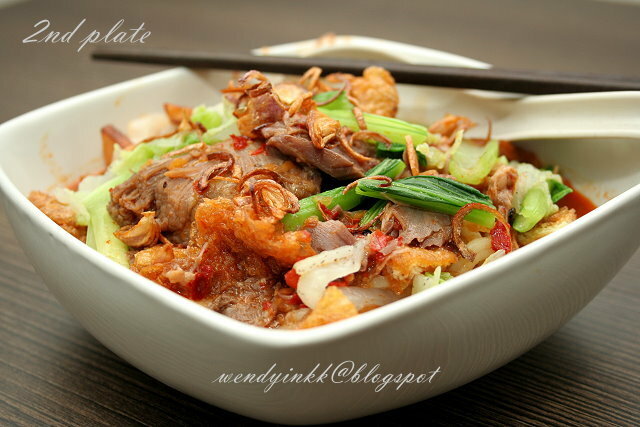 The flavours are all his favourites, Spicy but sweet at the same time, and served with his favourite yellow noodles. I'd say, it depends on your preference. It's delicious alright, but i am not addicted. Because I can't eat sweetish savoury food too often. 1. Prepare broth. Bring water to boil and put in everything. Bring back to a boil and lower to a simmer for 3 hours. 2. Peel potatoes and slice into 5mm thickness. Stack the potato slices and cut into quarters. 3. Crack egg into bowl and whisk it for 1 minute until frothy. 4. Heat 3/4 cup oil in wok or pan. 5. Fry the potato slices until golden. Dish up and drain. 6. Pour half the egg into the oil and it will puff up. Fry until golden and repeat with the balance of egg. Cut eggs into bite sized pieces. 7. With the balance of oil, sauté the chilli paste until it turns glossy. Pour the chili paste into the broth pot. Put in seasonings and bring it back to a boil. Taste and adjust with more seasonings if needed. If you notice, the meat turns darker and darker, the longer the gravy is kept. It is indeed more delicious this way. So, if you can, make it in advance and keep it for a few hours before meal time. OMG!! 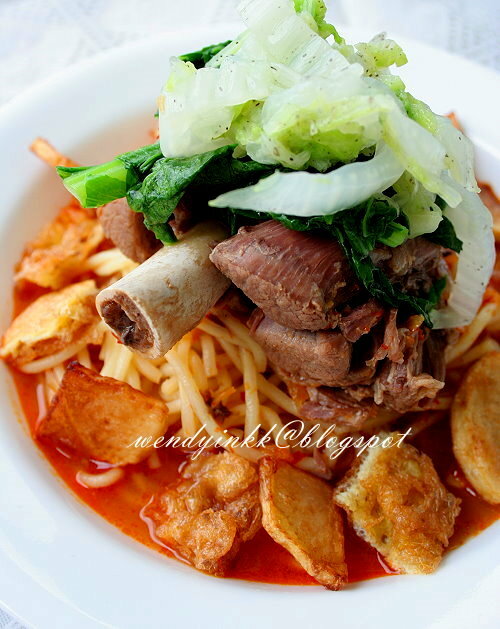 *droll* it's already 9pm here.. but see this, I think I can't sleep tonight LOL - what a name, really, the ingredients are kill me already, lambshank... what a precious recipe..
Fuyohhh... This is indeed poisonous!!! Looks good and it makes many meals! Racun tak racun, nampak memang sedap! Dah tahan looking at that last picture.... Thumbs up eventhough I have not tasted this before! ni mee mati...bukan racun lagi dah...ha ha ha...mati tengok uuu. Wow... 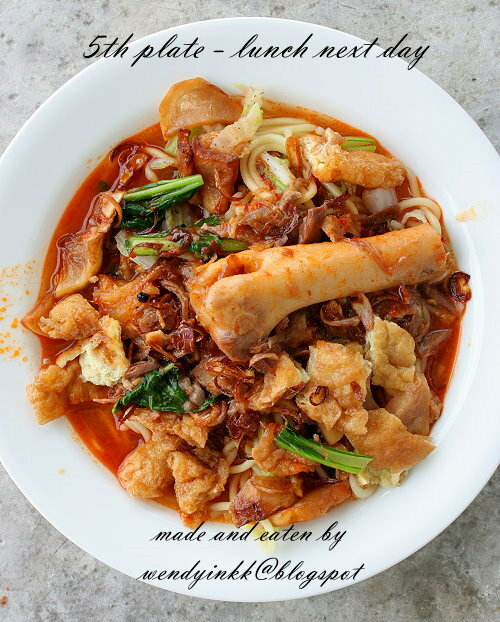 The title that caught my attention, would I dare to eat? hahaha, u're another lamb nut too? 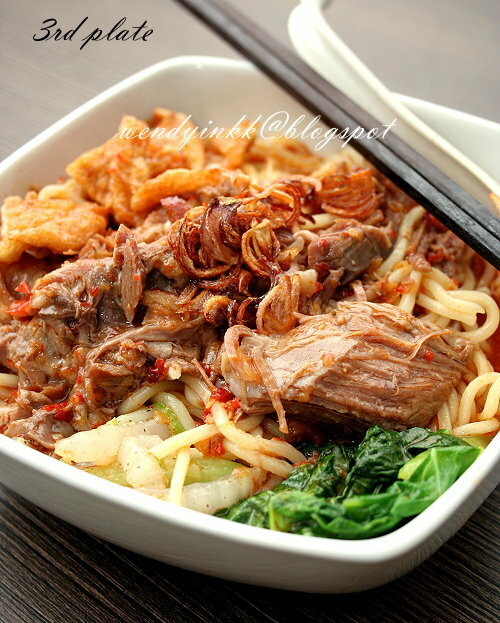 I always cook at least 4-6 portions each time i cook noodles with a gravy that takes a long simmering time. Very wasteful if cook just 2 portions. Try to go to BP. hahaha. Mati sebab mee yang sedap berbaloi! Worth being in heaven for food, haha. Wendy, If I'm not mistaken the original mee racun was made with spaghetti. 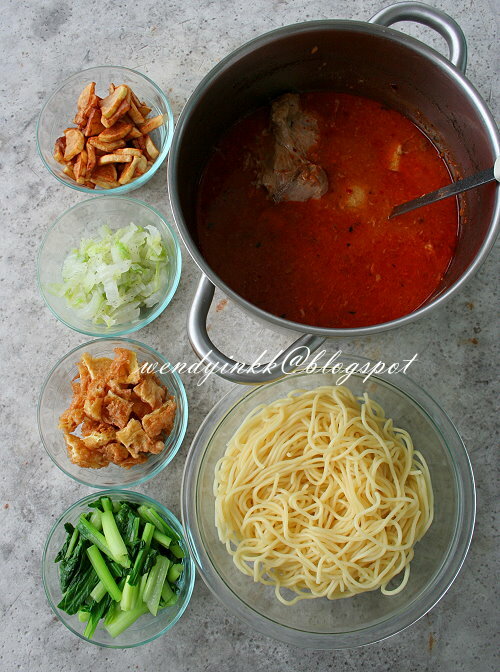 Well you know how the johorean like spaghetti so much that we use spaghetti as laksa. I tasted one long ago in the most popular mee racun stall in Batu Pahat ( one that started it all )but I don't quite remember if they use spaghetti or yellow mee. Alamak Wendy, only saw this now. 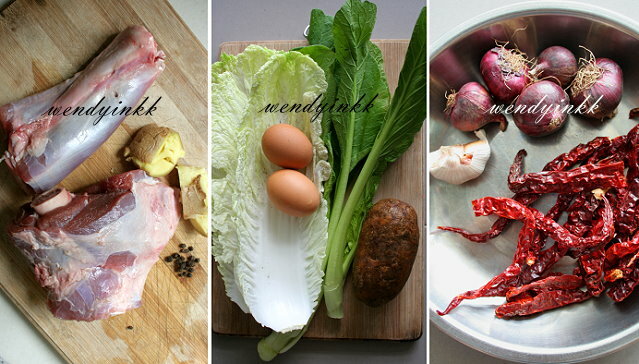 Looks really good and I have another way of using lamb shanks. :-) But thanks, will definitely be making this one day soon.